Spotted a new L&H Collection but seems to be filled with public domain and silent content. Discussion in 'DVD' started by rmw650, Nov 12, 2018. Long live the laughable, loveable, legends - the greatest comedy duo ever - LAUREL AND HARDY! 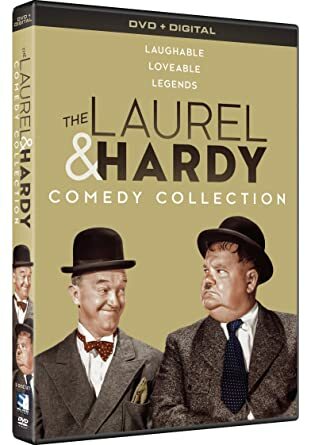 Enjoy 24 hilarious classic shorts, feature-length films, interview and home movies showcasing comedians Stan Laurel and Oliver Hardy. Seems like a cash grab to exploit the biographical film coming out. Perhaps interestingly, this 3 DVD set is being released by Mill Creek Entertainment. There's also a new Blu-ray set coming out in England released by Universal . Five feature films : Way Out West, Pardon Us . Sons Of The Desert, Our Relations and Blockheads . Its available at Amazon.com /UK. I don't see anything here that the long-term L&H fan has been wanting to get. At least I don't see anything that's different from the Platinum set I bought from Walmart in 2003. A worthless release? I wouldn't say that - a low-cost release like this could help make the L&H fan of the future. What we really need is a new release of the L&H silents (with the reconstructed version of The Battle of the Century), but no one on either side of the pond seems to be willing to do that - a curse on you Corinth Films! That said, I hear that the BFI is coming out with a blu-ray of the recent restoration of Atoll K/Utopia. If the release is region free, I might just go ahead and import unless there are rumblings of a state-side release (are you listening Kino). Guys, what's going on with the re-discovered reel two of Battle of the century and are we ever going to see it coming out on DVD along with charley chase Volume 2 Hal Roach talkies? With five prime features and at least three shorts as extras, it's almost the L&H equivalent of the restored Marx Brothers' sets. As it's from Universal, the discs will definitely be region free. But bear in mind if there are any SD extras they may be in PAL rather than NTSC, and may not play in regular region A/1 set-ups. As for the Mill Creek set above, it's a box of substandard, rehashed crap quality transfers that they and other bargain bin companies have released a hundred times before. Not worth watching even if you get it for free. Last time I checked, the DVD with the solo Stan Laurel films was out of print and selling for a great deal of money. If the prints on this set are good, it would be worth picking up for that alone. Those are really good films. If someone picks this up, let me know if it's decent picture quality. The Essential Collection (the Roach talkies) is still in print, is it not? I sure hope so. I saw it at Wal-Mart about a year ago for a pretty decent price. It's what I would call the standard Laurel & Hardy "starter kit." Some PD comp of mostly silent solo stuff, I don't think that's going to get them any new fans. It may even be a turnoff. Mark, yes, i still saw a few of those sets at Wal-mart I believe for $49.99 and maybe it'll be a lot cheaper with Black Friday next weekend happening, but yes, they're still in print. Mark Y and Tony Bensley like this. Cool. If they're smart, they'll be pushing that set and getting it out there when the movie comes out -- assuming it does well. I thought I had read Vivendi had gone out of business. Someone took them over, right? The Little Rascals set is said to still be in print, but not the individual volumes. I thought I saw the L&H set at Wal-Mart last year for less than $49.99 -- but that is still a good price. Anyway, regarding this new Mill Creek set -- I certainly welcome it if it's a quality product. It is good to have their solo silent era stuff available. But for new fans discovering the team, that's not the place to start. I’d love to see BATTLE OF THE CENTURY... will it ever get released? Hoping the new completed version of this short BOTC (as completed as it can be with the current materials available) will see the light of day soon. Their silent films are every bit as good as their talkies. Some people think they are the team's best. Stan Laurel was a genius and his solo films are extremely important too. The talkies reworked the basic themes of the silent films and slowed them down and added dialogue. The silents tend to have more action and slapstick. They're both great, but the silents are the ones that have been out of circulation the longest, and they've never gotten a really good release. If they could locate good prints and record good scores, people would realize that films like Big Business and Putting Pants on Phillip are among their greatest shorts... and are the equal of Keaton, Lloyd and Chaplin. I agree with you 100% regarding Laurel and Hardy's team silents. However, it was the non team silent solos (Featuring Stan Laurel OR Oliver Hardy, not both!) that Mark Y was referencing as not being the place to start for non Laurel and Hardy fans. I'm surprised that the release of this box set hasn't gotten more enthusiasm on this thread. Five of Stan and Ollie's best features on BD. I would think that most Laurel And Hardy fan's would want this . Tony Bensley and Bob Furmanek like this. Would these be remastered or, for instance, would it include the same old print of Way Out West with the unfortunate splice in the middle of the Blue Ridge Mountains song? a turk with a dirk may stick a clerk!" -Shemp Howard in "Blunder Boys"
No one knows what prints they are using. Hopefully, Universal will use the restored version of Way Out West from UCLA. But there's no way to know right now.